As in, tankless water heater! The house originally had a tank water heater shoved in front of the electric panel in the very tiny utility room. 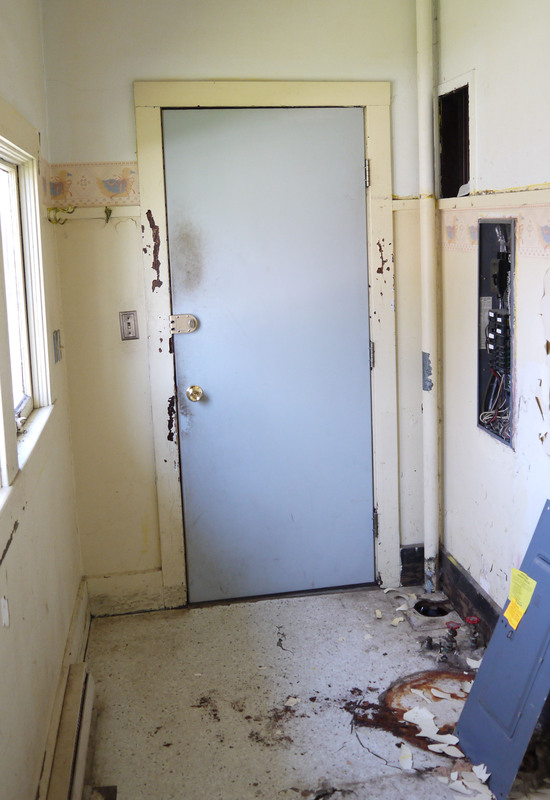 I remember the back door would hit it when fully opened, and I don’t think I could even open the electric panel completely until the water heater was carried out. And that alone proved interesting – my brother-in-law leaned the top toward himself (it was completely drained), and I went to pick it up from the bottom. Light weight, yes, and then my hand broke through the tank just from carrying it because the metal was so rusted. That’s probably a big part of why the laundry room wood floor is so discolored and sunken along that wall. Basically, if I wanted a standard washer and dryer in this room, there was no space for a conventional water heater. I had already cleared the trash out when I took these before photos of the entire house, but you can see the rusted ring on the floor where the old tank sat. And leaked. Slowly. For a long time, or so the floor boards would say. Well, not having a water heater isn’t such a big deal since I’m not living there yet. But once I got the plumbing finished and the kitchen sink hooked up, I was itching to get the tub cleaned and then also the leftover fridge which is pretty grimy inside and out. And technically I didn’t need hot water to do those things, but I wanted it. Cleaning is gross with cold water, but somehow not so gross when you have hot water. Here’s how the unit looks installed on the wall. I was able to order the water heater from my local Ace Hardware store (shop local is kind of my mantra – it goes with the job), and they had just 1 in stock at their warehouse. Ignore that the drywall isn’t finished on this wall, but I was in a hurry to get the water heater installed. It’s rather high on the wall, just about 2 feet below the 9′ ceiling. But because it’s opposite of a west-facing window, I wanted to make sure it wouldn’t be in direct sunlight and have that effect the multiple thermostats which control the heating elements. 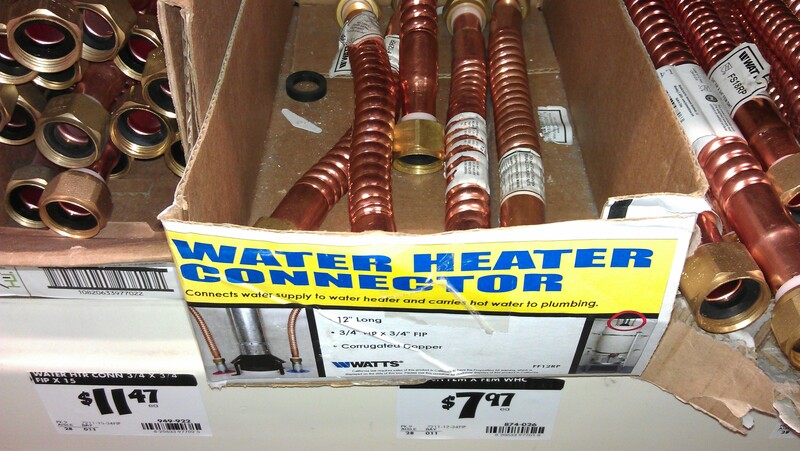 As the photo above shows, I used flexible copper water heater connections to transition into the wall, and then it transitions back into 3/4″ PEX. That was the round 2 decision. I first tried fancy PEX fittings to make the 90 degree bend out of the wall, and then a PEX to threaded connection to join to the water heater. The only problem was that the threaded PEX fitting didn’t have a rubber seal inside, and the small garden hose seals you can purchase wasn’t enough to keep it from leaking. So round 1 resulted in a very wet floor. And wet me. And wet Dennis – unable to connect the electrical, helped me decide that I needed to find another type of connection. He found it funny. At the time, I did not. But looking back, if that was the worst leak I ever have while I own this house then I’m not doing so bad after all. The photo above also shows the water heater in “sleep mode.” It probably has a more technical name (off? ), but the LED screen is blank when the unit is a rest. The screen doesn’t light up unless I adjust the temperature wheel or until I turn on a faucet to use the hot water. Then it’s lights on, displaying the hot water temperature setting. 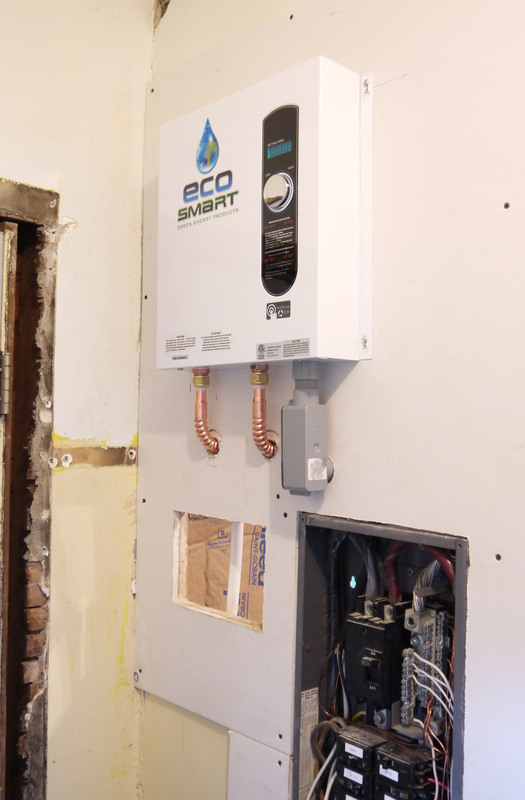 That’s why this unit is supposed to be such a dramatic difference in energy usage compared to a traditional tank water heater – it only uses electricity when I am actually using hot water. Unlike a tank, which uses electricity on and off constantly to keep the entire tank of water a consistent temperature. And even though it has a strong heating capacity, it knows how much water I am using and how cold the incoming water is, so it uses the minimum amount of electricity needed to reach a constant flowing hot temperature. I haven’t tested it with a thermometer yet, but I believe the numbers. 125 degrees feels normal to me for activities like washing dishes and showering. But for scrubbing the bathtub, I was filling gallon containers and pouring out a little at a time, so I had it turned up to 128 in the photo above. To sum it up, use the correct parts and pieces when installing a water heater to avoid saying bad words and having a wet floor. And wet clothes. And wet electrician helper. It seems to be working great so far, the water is fast to heat up to full temperature, and it stays steady for as long as the water is running. I’m eager to see how it will do (and how much faster the electric meter will spin) when I have a shower head, washing machine, and kitchen sink all pulling hot water at one time. But I’m a little ways off yet from being able to test it that way. If you decide to gut a bathroom, you will probably decide to upgrade the plumbing. If you need new plumbing in the bathroom, you should probably just replace the plumbing in the entire house. While running new plumbing, you realize it’s the perfect time to replace the outdoor spigot and add a second spigot to the opposite side of the house. When you want to run pipes to the kitchen, you realize the kitchen sink cabinet is actually metal, and the floor of this cabinet is nearly rusted away from years of leaking pipes. So if you are gonna re-plumb a house, you should probably tear out the deteriorating sink cabinet. Which means first lifting out the beautiful but extremely heavy cast iron sink. And when you get to the laundry room with it’s somewhat “soft” floor, you should probably tear up the multiple layers of linoleum and punky plywood. And once you have the bad flooring tore up, you realize that the original wood floor is too damaged to hold the weight and vibration of a full washing machine. So thats why if you are renovating a bathroom, you will probably need to replace the laundry room floor. That is where the cute children’s story ends for tonight. I finally have all of the old plumbing completely tore out, including the kitchen sink. I didn’t tear out all of these pipes right away, because it was kind of nice to use the old pipes as my straight line when running the new pex hose. The existing plumbing was a crazy labyrinth of galvanized, copper, pvc, and cast iron. And from how easily some of the connections came apart, I promise you it would have been leaking if the water was turned on. For the new plumbing, I’ve got almost all of the new supply lines run. I now need to purchase a roll of red pex (for hot water) and run those lines to carry heated water to each of the shower, kitchen and bath sinks. The red and blue hose are entirely the same except color, but the color keeps things well organized. I also need to make a decision on a new water heater. 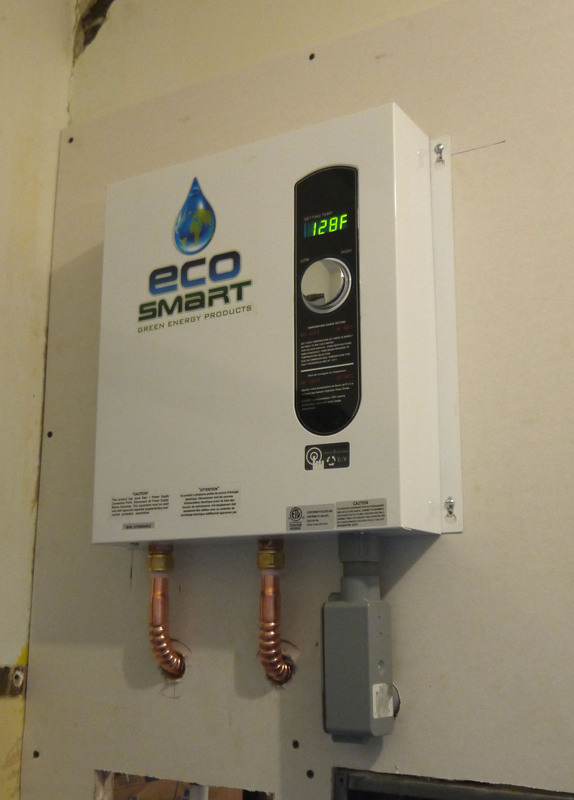 I’ve been researching tankless models, and I think I’ve decided on the ECO Smart brand. The prices are consistent with tank units, the reviews are good, and it seems very user intuitive. I can connect the water lines myself, but for the warranty to be valid, the electrical component must be wired by a licensed electrician. And of course, supply lines are only half of a house’s plumbing. The other half is the drain pipes. The former mixed PVC, copper, and cast iron sections of drains had sections that had come unglued and weren’t sloped properly. Most of this I know how to do with new pvc, including traps and the correct pitch, and adding air vents for each the kitchen sink and washer drain. But the sewer stack that takes all the wastewater out of the house is the original cast iron. I’m not sure the best way to transition into this. So I’ll try asking friends for help, and if they don’t know, I wouldn’t be against hiring this part to make sure it is done perfectly correct, but it probably won’t be cheap.